Lil Wayne claimed in a tweet Thursday night that he had been "denied by the team to be in their arena." Lil Wayne said a manager had advised him not to return to the city's arena for sports events or concerts, but "I never say never." 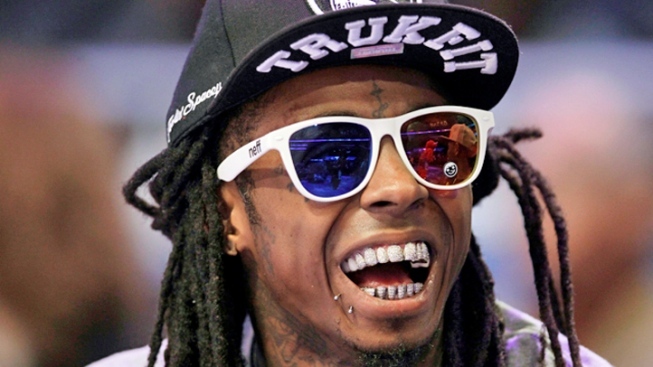 Lil Wayne said that after a recent NBA playoffs ticket dispute he felt unwelcome and "unwanted" at the Oklahoma City arena and isn't planning to return. The rapper said two Thunder players — Kevin Durant and James Harden — had reached out to offer him tickets to Saturday's fourth game of the Western Conference Finals. "That's not the point, though," he told The Associated Press in an interview Friday night. "It's the players stepping up but of course the players aren't white. I don't want to be sitting there on behalf of you and I'm sitting next to a (person) that's like 'I don't want this (guy) sitting next to me.' (Forget) you ... I'm in Forbes," he said, laughing. Lil Wayne claimed in a tweet Thursday night that he had been "denied by the team to be in their arena." The team responded by saying the seats he wanted were already taken. But the Grammy-winning rapper, appearing at a Macy's store in Los Angeles to promote his Trukfit clothing line, described a more complicated scenario. He said he typically procures tickets for such games "from this guy named Mike." Lil Wayne said Mike had requested special security, parking and entrance for the rapper, but Mike said the team responded that they would only sell the seats for Mike's personal use. He said he felt welcome at other arenas including Miami, and likes being able to energize players — many of whom are fans of his music — on their home court. "That's like me going on stage and ... seeing LeBron (James) in the crowd with his hand up. I'm going to perform a little bit harder," he said. But in Oklahoma, he said that while "the players want me there, I don't want to feel — I'm going to still feel unwanted." "Of course, when someone tells Lil Wayne, 'No,' that he can't come in, 'We're sold out,' you feel a certain way. Unfortunately, it had to go down like that," said Durant, the three-time NBA scoring champion. "We'd have loved to have him here in Oklahoma City. We'd have welcomed him with open arms. Hopefully, we get past that and next time he can come and enjoy a game." A team spokesman has said Lil Wayne's representatives insisted that he sit in the front row, and none of those seats were available. Oklahoma City sold out every home game during the regular season and playoffs. "It was just a misunderstanding. We were sold out of tickets, I heard, and we didn't come through," Durant said. "He knows a few of us on the team and he knows it's nothing like that. We offered him tickets to tonight but he had to do something. He's a superstar in his own right, so he can't just pick up and go to a game. "He had something to do, but I'm sure if his schedule was free, he would have came tonight. We're still inviting him to games — maybe not this year. Next year or whatever."